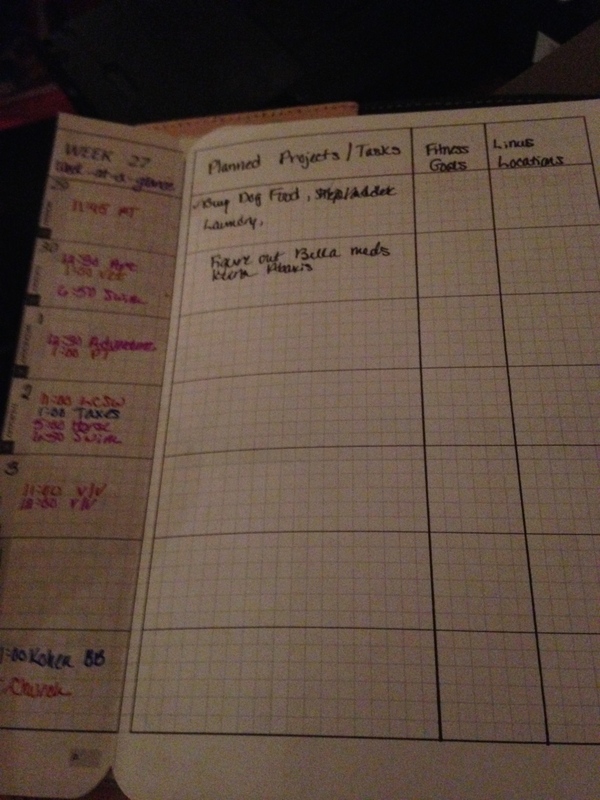 I started using my new Filofax setup with DIY Fish pages over the weekend. It was a slow start with most of my time still devoted to figuring out how to use pages. However, today was a big improvement. So, let’s check it out. I LOVE, LOVE, LOVE that these pages start on a Monday. For me, Sunday is for church, family, and winding down. My week really starts on Monday mentally. Calendars with a Sunday start have always been kind of offputting for me. This is much easier for how my brain plans. So the fold on the left is my “to do” list for this week. It’s kind of a strange week since two days are June and the rest are July. To keep from having to flip between months, I have tasks for the whole week here and I’ll only copy forward the stuff that doesn’t get done to the July Week 27 page. The top of the fold is stuff that HAS to get done this week, either because there are expirations dates involved or they are items that I just shouldn’t put off any longer. I have a long list of those that I’m trying to get caught up on now and I’d rather avoid a long list in the future. On the other side of the weekly fold, I have all my appointments so that I can see the week at a glance, even when I’m looking at a specific day. Just to the right of that is the big blank grid. I subdivided that into “Planned Projects,” which to my mind is different than a list of tasks, errands, or household chores. This may develop into something deeper later on. We’ll see. I have a “Fitness Goals” column which could range from doing my physical therapy consistently that week to drinking enough water to making sure I alternate major muscle groups from day to day. Physical fatigue is something I battle with so I have to watch this area. The last column is “Linus Locations,” which are my planned/recorded training field trips with my service dog. Since I’m training my own service dog, it’s extremely important that I keep accurate, detailed, and accessible training records. Apologies for the lighting. I started this before dark and added some photos after the lighting in my house got crappy. The next page is the “My Weekly Chart” page. I’m not sure how I want to use this right now. I’m still playing around with it. 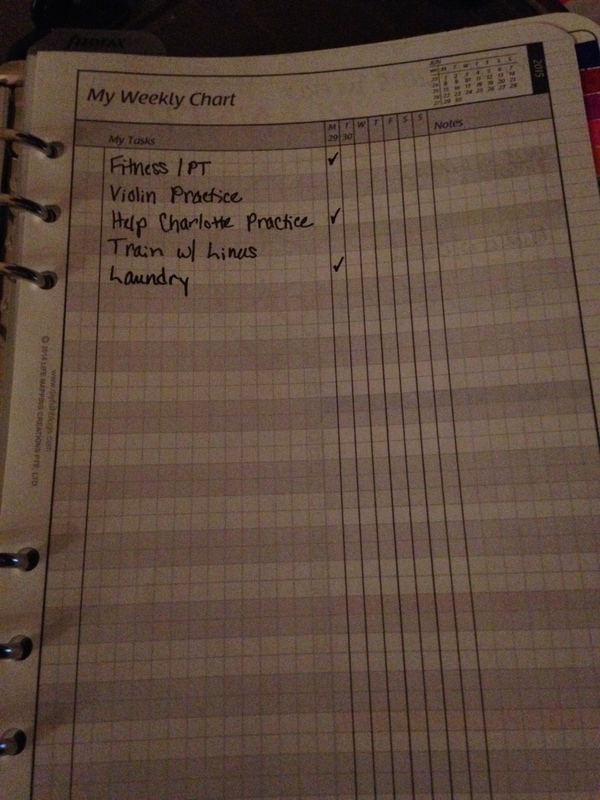 Right now it’s kind of a combination of “I need to do these things regularly throughout the week” and “I did these things consistently throughout the week.” Repeating stuff that I don’t necessarily want to write down every single day as a task but they still need to happen daily, like violin practice. 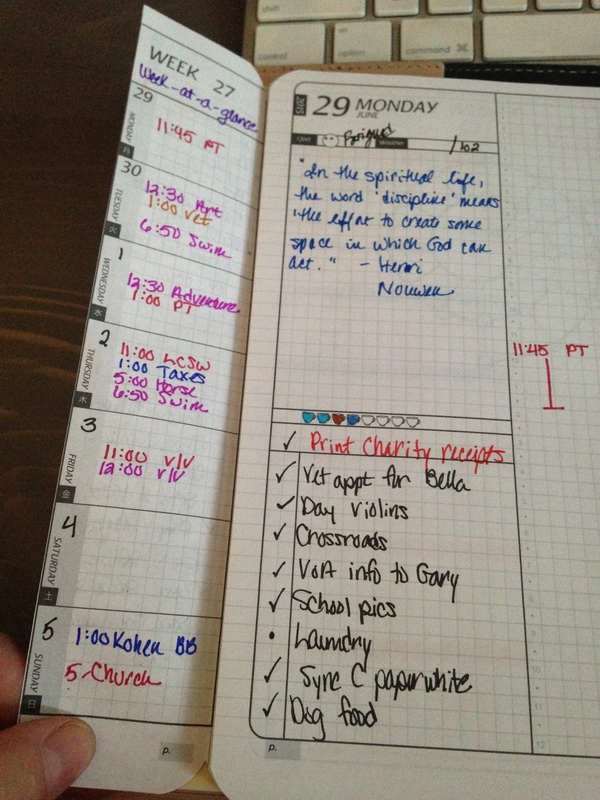 The back of that page is the colorful Weekly Planner page that I imagine I’ll probably use for meal planning and grocery/shopping list since that is something we struggle with in our home. It’s blank right now so there’s no photo. The following is my daily page for today. I only had one appointment today but I had a bunch of phone calls and emails I needed to return. The top smiley face area I used to put how I felt in general today. The right was the high temp for the day. Under that I copied down I quote I saw on Facebook sometime during the day. Below that is a place to record hydration. I put water in blue and coffee/diet soda in brown. I do both because for every cup of caffeinated drink you consume, you have to make up for it in water. If I’m not careful, I can spend the entire day drinking Diet Coke and never touching water. Under that space was my task list for the day. I put “print charity receipts” in red because it absolutely had to get done today. The right side of the Day on 2 Pages daily insert I’m using for tracking and general notetaking. I copied down a phone number from a voice mail message for a charity I have to contact this week. 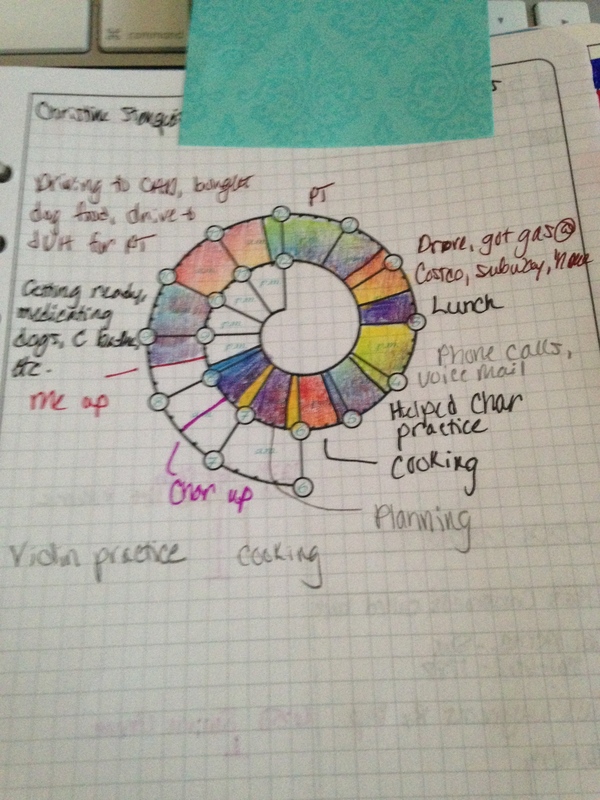 My Spiraldex shows me how I spent my day. 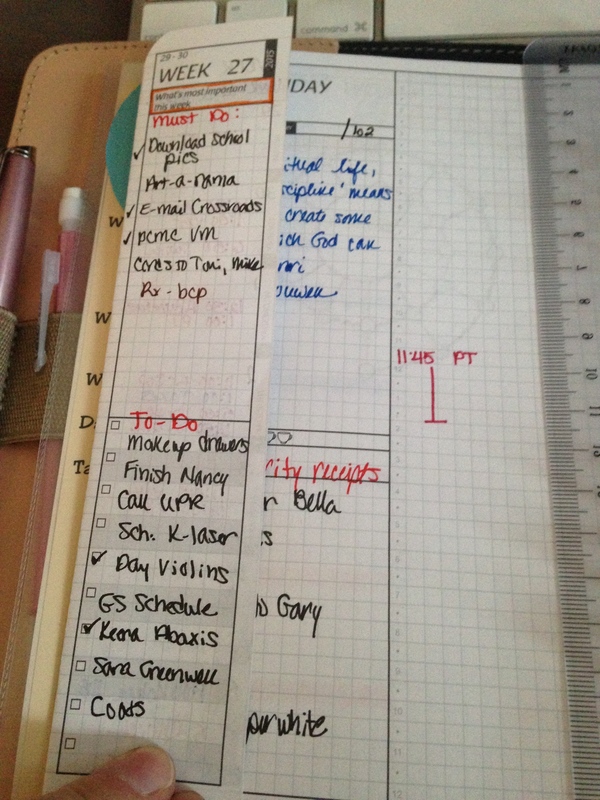 I wasn’t obsessive about it but as I finished up a project or task, I marked a line at the start time and another at the end time and then colored the area in and made a note about what it was. The idea is that when I’m having a day when I just have no idea where the time went or what the heck I did with my day, which with my condition can be very anxiety producing, I can glance at my Spiraldex and see. I can also mark times when I lost time to fugue or flashbacks or dissociation, which is really helpful in heading off big dips in my mental health. I didn’t have anything that I felt I needed to make searchable later so I don’t have any color coding on these pages.